This user guide describes features available in the latest current version (1.0.9). If you are running an older version, please check our updates page now. To Navigate this user guide, click the ≡ hamburger icon fixed at the top-right corner of this page. Before you begin, make sure you are working inside a defined Dreamweaver web site. This is necessary so that Dreamweaver knows how to link required assets. If you are new to Dreamweaver or need to learn how to define a web site, please see the documentation that came with your copy of Dreamweaver. If you are using BFA on a new page, or for the first time on an existing page, simply click anywhere on the page in Design View. 1. 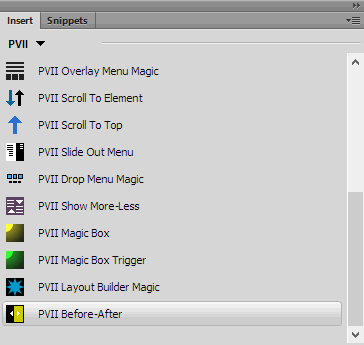 Click the BFA icon in the PVII of Dreamweaver's Insert Bar or Insert Panel. The BFA interface will open in the Create or Modify mode., depending on whether you are creating a new widget or editing an existing one. When you create a BFA widget, the system creates an assets folder named p7bfa at the same level as the page that contains your BFA widget. 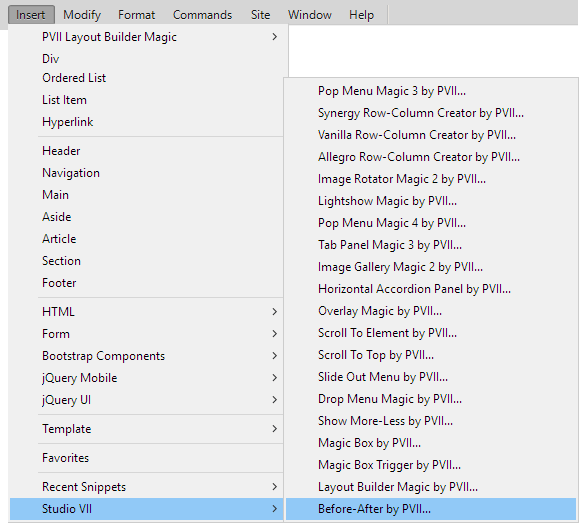 When you publish your site, make sure you upload all p7bfa folders. Let's explore each section of the interface and the options they support. In Reveal mode, Image B, which sits above Image A in the stacking order, acts as if it's a horizontal window shade, rolling itself up over Image A. In the process, Image A is revealed or hidden. Neither of the images actually moves, the effect is, as the name implies, the act of revealing and hiding parts of Image A. This mode works well for retouched/restored images, where scene and perspective are identical, as one image will appear to morph into the other as you drag. In this mode, a drag arrow icon (which can be set light or dark) appears along the line that divides the viewport. This icon gives a good visual clue as to how the widget works. Users can drag the icon or the images. In this mode, Image B is dragged over the top of Image A. As Image B is dragged, it becomes semi-transparent, allowing the user to see the underlying Image A in its entirety. This mode is ideal for comparing before and after images, where the scene or perspective of each image is markedly different. This mode also uses the drag icon appears along the line that divides the viewport. This icon gives a good visual clue as to how the widget works. Users can drag the icon or the images. As its name implies, this mode allows each image to appear side-by-side, within a divided viewport, whose boundary is defined by a vertical line. The width of each viewport is determined by the starting position (a percentage) set by the designer. If the starting position is 50%, for example, each viewport will be exactly half as wide as the entire viewport. The user can drag from any point within the viewport, and both images will move simultaneously and in perfect sync. As each image crosses the viewport boundary, it passes underneath. 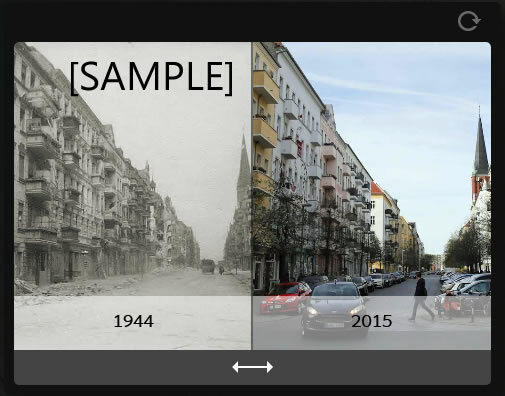 This can be a powerful way to compare historic or technical images. 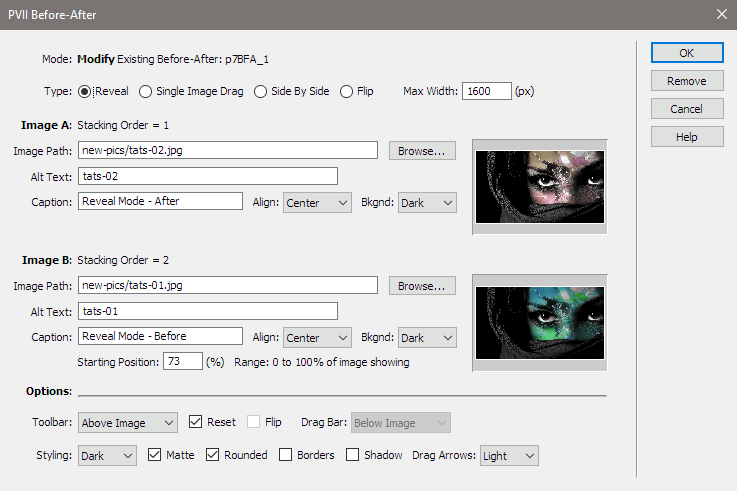 When this mode is selected, a Drag Bar is created, by default, which can be set to appear either above or below the image. Users can either drag the images or use the drag bar. The screen capture below depicts Side by Side mode with Drag Bar below image, a toolbar with reset icon above, and optional captions. This is a thoroughly modern and responsive version of the old swap-image effects popular in the late 1990s. A toolbar, containing the Flip icon is displayed on a toolbar, either above or below the images. Clicking the icon triggers a swap-image effect, with a fade animation. When you browse to an image, the UI automatically sets the Max Width value to the natural width of your image. You can accept that value or change it, depending on your needs. Since BFA is an image comparison widget, you need to select two images, each the same size. Enter the path or Browse to your image. By default, we set the value to the image file name. Change it to whatever you want. Enter a caption into the box and it will appear overlaid near the bottom of your image. Set alignment for your caption. Each cation can be set separately. Choose a light or dark semi-transparent background color for your captions. Manage the starting position for your comparison using a percentage value. 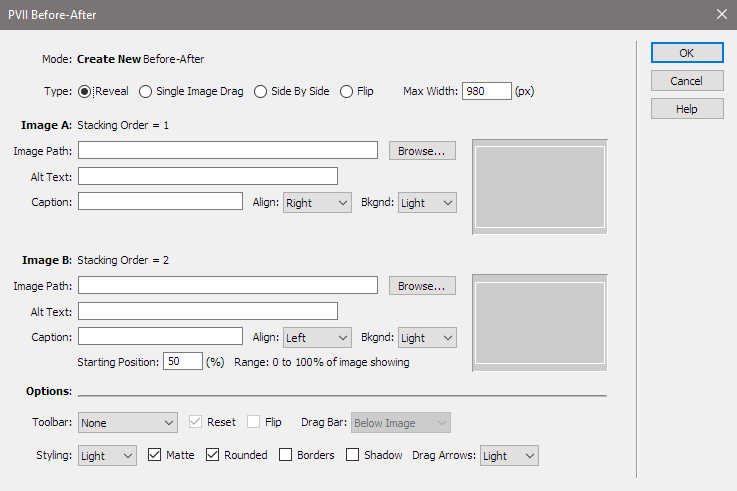 Display a toolbar with a reset icon above or below your images. This icon allows users to reset the starting position to what it was when the page first loaded. If using Flip mode, a toolbar will be created automatically, containing the Flip icon. You can add the Reset icon to the toolbar when using Flip mode. When using Side by Side mode, a Drag Bar is required. You can place it above or below your images. Set various and self-explanatory styling options. © 2016 Project Seven Development. All Rights Reserved.